The pine trees at the entrance of the sports field were originally next to a grave. An elder said he had found them with about eight other good pine trees. He wanted to give them to us as gifts, so Pastor Jung Myung Seok sent some of our workers to get them. At that time, we were developing the rock landscape in Wolmyeongdong. 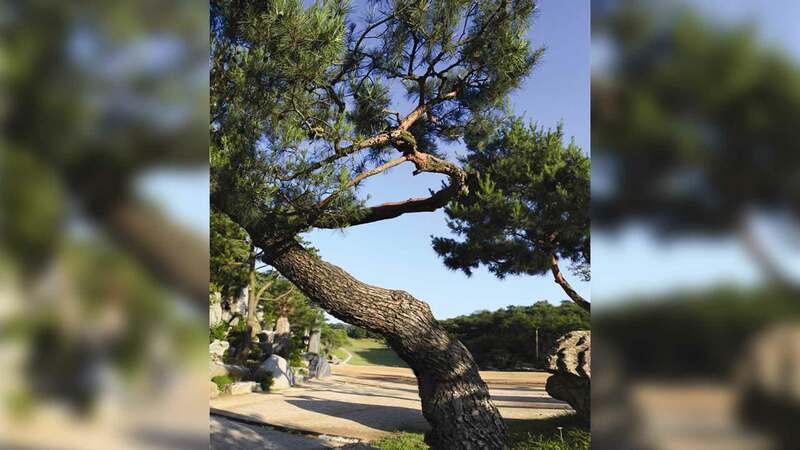 Because Pastor Jung did not think of pruning them at that time, he told the workers to bring the pine trees without pruning them. We were originally planning on bringing a gaburi pine tree and another tree that looked like a Y. However, the trees were too big, so it was difficult to bring them as they were. The villagers also blocked us from taking the pine trees to Wolmyeongdong. They wanted us to give them compensation in case the road got damaged during the process of transporting the pine trees. We had no choice but to sign a promissory note stating that we would compensate any damages to the road. We could bring only two trees out of the ten that we had originally planned to bring. While transporting the trees, many branches were broken because they got stuck here and there. When Pastor Jung looked at the trees after they were brought to Wolmyeongdong, he felt dejected. When he first saw the trees in the picture, they seemed to have dense pine leaves, and they looked beautiful. But after they were brought, their branches were damaged and not many leaves were left. Only their skeleton remained. The trees had gone through many difficulties in the process of being brought to Wolmyeongdong. The elder who brought the trees, promised to bring better trees next time because he felt embarrassed. However, Pastor Jung decided to plant the pine trees anyway since we had already brought them. After we planted the trees, Pastor Jung realized God’s working. He originally did not prune the trees because he thought the trees were too precious to be pruned. But while we were transporting the tree, God pruned them for him. God pruned the trees by making us pass through a tunnel while we were transporting the trees. As we were going through the tunnel, big branches broke off and each tree’s shape actually ended up looking better. They all became masterpieces of nature. In this way, whenever you work on certain things, you don’t need to feel disappointed or discouraged when things don’t work out the way you expect. Since God has a different Will, there is a reason for things not working out according to your intentions. So, you should always think about where God’s Will is.